Winnemucca is the largest of the small number of cities along I-80 in north Nevada, with the best selection of lodging and other services. About half way (165 miles) between Reno and Wells, the city is centered on the Union Pacific railroad, with a mostly residential neighborhood to the south and the business district/downtown area to the north, bordered by the interstate, with the Humboldt River just beyond. Most facilities are along the main street, Winnemucca Boulevard. There are several mountain ranges nearby, highest being the Sonoma Range to the south, but they are not part of national forest land and contain no sites of particular interest. 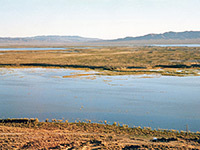 The nearest attraction (45 miles) is Rye Patch State Recreation Area, a branched reservoir on the Humboldt River, enclosed by low desert hills. Winnemucca's Holiday Inn Express is the first hotel to greet travelers arriving from the southwest, located on Winnemucca Boulevard (NV 289) beside exit 176 of interstate 80, next to a Wal-Mart store, at the edge of town. A restaurant and R&L's Express Casino are right next door, while the center of Winnemucca is one mile northeast. The main hotel amenities are an indoor pool, whirlpool, guest laundry, ATM, business center and meeting space. Free hot breakfast buffet is provided each morning. All accommodations contain a microwave and mini refrigerator. New for spring 2014, Candlewood Suites is the first all-suite/extended stay hotel in Winnemucca, catering for guests in extra large and well-equipped rooms that all contain a full kitchen and executive work desk. The hotel has a northerly location in Winnemucca close to I-80 exit 178, near a few restaurants and gas stations; most facilities in town, including the local supermarket, are a mile or so south, though Winnemucca Convention Center is just 0.4 miles away. A fitness center, convenience store, business center and free wi-fi are the main amenities. The 71 room, interior corridor Best Western Gold Country Inn sits just a few blocks from downtown Winnemucca and is easily reached from two exits of I-80; 176 south of town or 178 to the north. The hotel features an outdoor pool next to a small garden, spacious rooms with patios or balconies, free continental breakfast and a courtesy shuttle to the municipal airport, 6 miles south. There are several restaurants and casinos nearby, and a supermarket just down the street. Quality Inn Winnemucca is one of many hotels along the main road through town, Winnemucca Boulevard (NV 289), half a mile southwest of the center. The inn has a wide range of facilities with a casino (Model T), lounge/bar, restaurant and convenience store all on site, plus an RV campground and outdoor pool. There is enough parking space for the largest trucks. The hotel operates a shuttle to selected sites nearby, including the Greyhound station, train station and local cinema. Guest rooms are large, if a little dated. Although situated along busy Winnemucca Boulevard, the main road through town, the Super 8 is set back about 300 feet from the highway, behind two restaurants, and so offers quiet, peaceful lodging. Other nearby facilities are a supermarket adjacent and a shopping center on the far side of the road. East facing rooms have views across desert lands towards the wooded peaks of the Sonoma Range. The exterior has a colorful, new-looking appearance; inside, amenities are free wi-fi, free continental breakfast and a hot tub in selected accommodations. Motel 6 Winnemucca occupies an older, two floor, exterior corridor building along the main road through town, near I-80 exit 276. The property adjoins a truck stop, and the interstate runs past to the rear, so accommodations may be somewhat noisy, but rates are low and there are plenty of restaurants and small shops within walking distance. Amenities are an outdoor pool, wi-fi, coin-operated laundry and free coffee.